How do new ErP emission targets affect oil-fired boilers? New ErP emission targets came into force in September, so installers must ensure the oil-fired boilers they install are compliant, explains Anna Wakefield – Marketing Manager for Grant UK. The next phase of the EU’s Energy-related Products Directive came into effect on 26 September this year. New legislation will set maximum nitrogen oxides (NOx) emission levels that space heaters will need to meet, reducing the overall NOx emissions produced from heating. For oil-fired boilers, the NOx emissions target will be a maximum of 120mg/kWh so all oil boilers placed on the market by a manufacturer on or after 26 September will need to be compliant. One of the overarching objectives of the new legislation is to help improve the air quality by reducing pollution. In response to both Government regulations and a growing demand from homeowners, manufacturers have continuously explored ways to make their products more efficient and sustainable. The good news is that advances with burner technology coupled to Grant’s efficient boiler designs have enabled all of its Vortex Pro and Eco boiler ranges to achieve these new targets with virtually no visible change to the existing line-up. Grant’s VortexBlue (Blue Flame) range had already far exceeded these lower NOx emission targets from their launch in 2016 and are steadily increasing in popularity. To reflect confidence in this range, comprehensive guarantees of up to 10 years are available on VortexBlue boilers through the G1 installer network and, for installers new to this scheme, it is easy to register and gain these benefits (subject to Terms and Conditions). The Grant Vortex low-NOx models include utility, external, boiler house, combi and wall-hung boilers – all of which incorporate this new low-NOx technology. 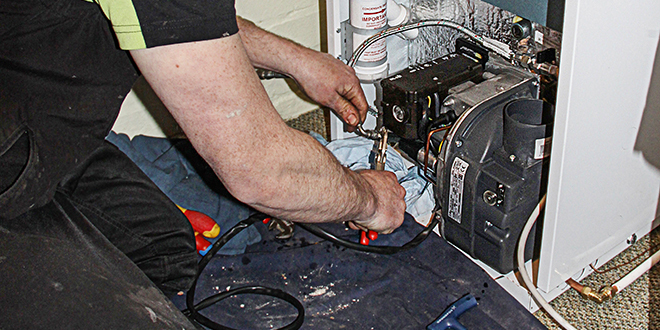 The majority of components within the burners – such as fuel pumps, motors and control boxes – remain the same as before, thus delivering continuity and familiarity for installers and engineers. In addition, there will be no changes to the product codes or retail prices, which will further help deliver a seamless transition to low NOx models. To help meet rising demand for its products and ensure prompt service to customers, Grant UK has also enhanced its storage capacity in Devizes. This includes the recent development of an extensive new warehouse that has tripled the on-site storage capacity. To coincide with this, the Grant Spares operation has also had a re-fit – allowing for greater stock holding and making these items more accessible to engineers up and down the country. With over forty years of pioneering R&D behind each of its products, the Grant brand has established itself a reputation for innovation, efficiency and reliability. Consequently, Grant oil boilers, such as the Vortex Pro Utility 15/26kW and VortexBlue Combi 26kW – both Which? Best Buys in 2017 – are the favoured choice for many installers and homeowners. This latest product development once again demonstrates how Grant boilers meet the needs of the evolving market place well in advance of new legislation and changes.